Looking for exercise bike reviews? We have selected the best exercise bike in each price bracket and category, making it easier to find the right bike. So whether you have a £100 or £1000 budget, you can find a bike that fits your requirements. A well-designed, exceptional upright exercise bike that is the best on our list in terms of resistance and build. There are 32 levels of resistance offered, and all resistance is computer controlled – a rarity. Users up to 140kg can use this bike, and handle pulse sensors are built into the handlebars. You can also use a wireless chest strap (not included). There are also manual programs and 12 pre-set programs available. User modes and heart rate modes are available, too. The only downside is that this model is in the mid- to high-price range. However, for the quality and the features offered, this is the absolute best buy in terms of value for money that makes it top of our list. You may also be interested in our DKN AM-E exercise bike review. Smooth riding experience. Closely replicates road cycling. The JLL IC300 is a cycling bike that is great for beginners, yet it’s advanced enough that even serious athletes will get a great workout when using it. There are six handlebar adjustments, six horizontal seat adjustments and ten vertical seat adjustments. I couldn’t see this bike not being able to accommodate a user’s height. Strong and reliable, the direct-chain allows you to pedal forward and backward while the built-in pulse sensor will track your pulse at all times. And this model can accommodate user weights of up to 130kg. Compact, this spinner has transport wheels, so you can easily move it to your desired location. If you have the budget, this is one of the best spinners on the market today. You can even ride it standing up to boost your intensity level. Right on the machine, you’ll find that there is a pulse grip that allows you to monitor your heart rate when in motion. Tension is controlled via a dial right below the LCD display. Smaller users may have difficulty on the machine as the saddle is a little on the high side, but it is very comfortable. Noise production is very minimal with this bike, and the maximum user weight is 100 kg. You’d be hard-pressed to find an upright exercise with this level of quality at a cheaper price. It may lack some advanced functionality, but it’s highly affordable and one of the best bikes in terms of quality for price. For a detailed review of this bike check out our Ultrasport F Bike page. The 110 is one of the most popular models around right now and customers have given it good reviews so expect to be pleasantly surprised if you decide to get one of these. 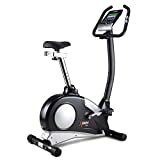 This is probably due to the low price of this bike combined with all the basic features, which is what many people are looking for in a home exercise bike. It has a quality design that is aesthetically pleasing compared to other bikes in the same price range which is a bonus. As far as practicality goes the wheels are useful for moving it around but not as convenient as a folding exercise bike that can be stored easily. But it does feel much more solid than the fold up bikes. With a max user weight of 120kg this bike is quite sturdy and the components are well made. The console is fairly basic and the resistance is controlled from the dial on the upright stem so for anyone who likes to be able to change the resistance from the console you might want to get one of the other bikes in York’s exercise bike range. Overall this is a good bike for beginners. Read our Detailed York Active 110 Exercise Cycle Review. Heart rate controlled programs to help you reach your fitness goals faster. 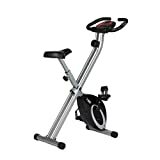 The JTX Cyclo-5 is designed as a gym quality exercise bike for home use and has a price tag to match. Although most bikes that we review on IndoorBiker are low to mid-range we felt that this bike was popular enough to warrant a spot on our bike list. The 8.5kg flywheel allows this bike to offer a wide range of resistance levels. So beginners and experienced users can get the most out of their workouts, which isn’t always possible on other models with a limited range. The frame on this bike is very sturdy and we can see why JTX offer a lifetime warranty on the frame, they are confident it will last. The whole bike, when shipped, weighs 63kg so if you need to move this bike upstairs make sure you have some extra help. The console on this bike is more advanced than most, and can connect to other devices (e.g. phone/ipad/tablet) which is very useful for tracking workouts and making them a bit more interesting with the interactive video workouts that change to reflect real locations. If you are serious about being able to exercise from home and ditch the gym membership then this bike does provide a reasonable investment for its price. A stationary bike allows you to effectively ride to nowhere. You can sit in front of your television or listen to music while pedaling as fast or slow as you see fit. Without weather hampering your chances of biking for hours at a time, you can benefit from biking as often as you want. Calories Burned: Cardiovascular activity is known for its high caloric expenditure. Dependent on intensity and your body weight, you can burn over 500 calories an hour on an exercise bike. Low Injury Risk: Biking movements are simple and joint-friendly. Older users will enjoy the benefits an exercise bike has to offer due to no stress being put on the hips, knees or other joints. Muscle Toning: Through intense sessions, your muscles will start to become toned. Adding in resistance or pedaling at a higher speed, you can further tone and build your muscles. Not only will your quadriceps, calves and glutes become more toned, but so will your upper body when using the handlebars. Easy Advancement: Pedaling faster will provide better results. As a rider, you can increase your intensity as you see fit to push your results even further. Increased Energy: A recent study showed that biking increased energy levels in participants by 20 percent. Furthermore, due to the release of dopamine by the brain, fatigue levels dropped by 65 percent. Cardiovascular Benefits: Intense cardiovascular workouts will force more blood into your heart and cause your lungs to expand. By biking for under 3 hours per week, bad cholesterol is decreased, good cholesterol increased and blood pressure is lowered. Blood sugar is further regulated at this time. Save space: Don’t have much space at home for a large exercise bike? There are a wide range of folding exercise bikes that can be easily stored when not in use. Whether you’re trying to lose weight or remain in optimal health, the a home exercise bike will help you achieve your goals. What’s the right type of exercise bike for you? Let’s take a look at some recumbent, spinner or upright models. An upright stationary bike is just like a bike you would use to ride around town. These bikes include handles, a smaller seat and the ability to stand up. When riding, you will be in an upright position, which puts more pressure on the lower extremities than a recumbent model would. Recumbent exercise bikes became quite popular 10 years ago. These bikes, often ideal for seniors, have a standard seat much like those seen in a chair. The rider is reclined slightly back, alleviating all of the pressure that would be on the knees and ankles. The handlebars may or may not move with a recumbent exercise bike. Oftentimes, spinning bikes are viewed as upright bikes. This, however, is not accurate. You can tell a spinner bike apart from other models by the handlebars. The handlebars are often pushed forward allowing for the rider to bend over while riding. These bikes allow for the utmost in intensity and provide a variety of seating positions. While you may think that the recumbent model, due to it being reclined, may be easier, it is virtually the same as an upright model. In fact, a recumbent bike may be a little harder to crank than the upright model, but the reduction of stress on the joints is definitely welcomed by riders that are older. If you’re older, have knee problems or want an age-friendly bike, a recumbent is the optimal choice. All models will provide the same great benefits as mentioned before. Personally, I feel as if the upright model allows me to push myself to higher speeds, producing a better overall workout. At first glance you will notice that the assault bike doesn’t look anything like the other exercise bikes on the market. The biggest difference with an air bike is that the handles move so you an get an upper and lower body workout at the same time. They use a big fan to generate the unlimited resistance, so the hard you work the greater the resistance. The assault bike is great for HIIT training and is often the weapon on choice for CrossFit athletes. You may also be interested in our best assault bike page. You’re probably wondering why there is such a wide gap in the amount of calories burned. These numbers are a pure reflection of intensity. If you ride at a slow pace, you’ll burn 325 calories per hour. Pushing yourself to extremes, you can burn over 1,100 calories per hour on a stationary bike. A moderate assessment is that you’ll burn 500+ calories an hour on a stationary bike. In terms of comfort and joint health, stationary bikes are the absolute best. You’ll find that study after study demonstrates the same findings: nothing beats an exercise bike in terms of joint-friendliness. Treadmills and steppers are often the most difficult. Requiring extreme balance, these machines can lead to injury and may also pose greater risks. Bikes and rowers have very low risks of injuries and provide movements that promote full range of motion. Muscle gains seen between cardiovascular machines are difficult to assess. Depending on the intensity and machine tension settings, each machine provides a great overall workout. Rowers may have a slight advantage due to arm usage, but stationary bikes with moving handles are on par with rowing machines in terms of muscle gain potential. Which bike is right for you? This is the ultimate question and one that is difficult to answer. All bikes have their pros and cons, but by knowing a little bit about how these bikes work, you’ll be able to choose the perfect fit for you. Discussed previously. A normal (i.e. upright) model or a recumbent can be chosen. If you’re older, definitely choose a recumbent model. If you’re younger or not yet a senior, the choice is yours. I personally like the upright models due to the leverage an upright position provides. From my experience, weight limits can often be exceeded, but this does not mean issues won’t arise. Before purchasing, ensure your current bodyweight is within the bike’s limit. Looking to gain muscle and keep a toned body? Resistance allows you to increase the tension and challenge your muscles, leading to muscle gain. Resistance levels should be provided so that you can enhance your workout as you advance. If you’re just trying to boost cardiovascular health, resistance will be less of a concern. LCD screens and on-board computers allow you to bike with a friendly program and statistics. Some models, those in the higher price bracket, allow you to adjust program settings and often choose from pre-set workouts. Live in a small space? The storage options available will be very important if you live in an apartment or don’t plan to leave your unit out. If storage is an issue, you’ll want a folding exercise bike. These models can be found in every price range. You’ll find prices can range from less than a hundred pounds to several hundred pounds or higher. The higher priced models often come with advanced functionality and are meant for commercial users. If you already own a road bike them a cheaper alternative to buying an exercise bike are turbo trainers, take a look at our best turbo trainer guide to learn more. Reviews will let you know what real buyers liked and disliked about a certain model. Always check out reviews prior to purchasing. Frequent problems, such as a motor going bad, can help you eliminate any potential problems in the future. 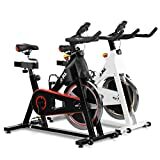 It is worth remembering that there are many cheap exercise bikes that are good value for money and expensive bikes that will be a disappointment, so make sure to research before you buy.